Looking at a brand new year with new goals can help revitalize your team’s attitudes and renew their energy. 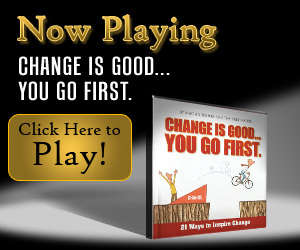 Build on their enthusiasm by sharing the movie “Change is Good…You Go First.” It will inspire them to transfer their enthusiasm into actions that will move them out of their comfort zones, closer to their goals each day and they will begin to see change as a wonderful gift! Man's yesterday may ne'er be like his morrow; Nought may endure but Mutability. ~Percy Bysshe Shelley, "Mutability"
Leadership lessons that should be in every managers library. Each one has an unforgettable message and makes a great meeting takeaway! Watch these teambuilding movies now ! We have high and often conflicting expectations of leaders. Be reasonable but passionate. Decisive but inclusive. Visionary but explicit. Powerful but humble. Add to that emotionally intelligent, caring, impartial, people-oriented, and of course, profit-driven. The list is so long that it often leaves leaders scratching their heads, thinking: how am I supposed to be all of these things at once? The answer is courage. It's what enables a leader to face tough times and step up to the plate. It is what gives leadership its backbone. Courageous Leadership is a comprehensive training package that introduces courage-building, a practice that guides leaders to meet challenges more readily, embrace change more fully, and speak more assertively. Courage-building is all about developing capable and confident leaders who can transform organizations. A combination assessment, workbook, and workshop, Courageous Leadership gives leaders at all levels the foundational skills and abilities they need to become more courageous. Learning Outcomes: Understand the impact fear has on personal and organizational performance. Identify which of the three types of courage one uses most often. Learn about three types of courage and when (and how) to use each. Discover two distinct ways of leading that inspire more courageous behavior. Find opportunities to apply courage frequently. Uses for Courageous Leadership, Courageous Leadership can be used at multiple levels of your organization. It's particularly appropriate for mid-level managers, and it also provides many benefits to new and emerging leaders. The Courageous Leadership Profile helps identify which type of courage leaders choose most often, and highlights which areas require more confidence. It pinpoints the situations in which they are likely to act courageously, as well as those situations in which they are most likely to "play it safe." 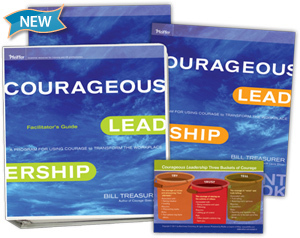 The participant workbook offers tips and techniques for raising one's scores in the area that would benefit from the application of more courage. The Courageous Leadership workshop introduces people to a specific understanding of courage, illustrates how they can become more courageous, and demonstrates the vital role courage has in the workplace and our lives.